what is a minimum qualification required for MBA studies? Required minimum qualifications to do MBA? Required qualifications to pursue MBA? Re: Required qualifications for MBA? Entrance exam :- Though we have many entrance exam for the admission in MBA but the main exam on which you should focus is CAT. CAT :- CAT is a MBA entrance exam which is conducted by Indian institute of Managements. It is a exam conducted once in a year for admission in the premiere management institute of India. The exam is objective type and you will see there are 5 major sections such as English, Maths, GK, Reasoning and mental ability. For IIM's one should not expect calls if they got below 95% and this shows the toughness of the exam. MBA STAND FOR A MASTER OF BUSINESS ADMINISTRATION , AND IT IS A QUIT POPULAR AMONG YOUTH ALSO , AND NOT EVEN THAT IT OFFERS A GREAT SCOPE AND AFTER COMPLETION OF MBA STUDY , PEOPLE GET GOOD JOBS ACCORDING TO THEIR CAPABILITY AND HARD WORKING . ELIGIBILITY FOR MBA IS SAME FOR EVERY ONE AND FOR EVERY FIELD THAT IS ONE NEEDS TO CLEAR THEIR GRADUATION WITH PERCENTAGE OF 50% IN ANY DISCIPLINE THEY BELONG TO , THERE IS NO SUCH ISSUE REGARDING AGE LIMIT ALSO. THAT IS ONE CAN DO MBA AT ANY AGE . MBA COURSE DURATION IS FOR 2 YEARS , AND MBA CAN BE DONE THROUGH REGULAR MODE AS WELL AS DISTANCE MODE ALSO. HENCE IT IS THE CHOICE OF INDIVIDUAL WHAT THEY WANT TO TAKE EITHER STUDY THROUGH REGULAR MEDIUM OR THROUGH DISTANCE MEDIUM . You should be graduate under 10+12+(3/4) stream with 50 % from recognized institute in India. In order to get seats at top B schools,You will have to clear entrance exams like CAT,MAT,XAT etc..
You will have to score more than 98% marks in CAT or MAT if you want to get admission in IIM and if you score more than 95% marks then also you may get very good institute for MBA. The minimum qualification for MBA is that you should qualify your graduation with at least 50% of marks in any discipline by any recognized institute or university. There may be some relaxation to those candidates which comes under the categories of ST/SC/OBC/PD of 5% i.e they just required 45 to qualified for any entrance exam of MBA like CAT,MAT,CMAT,XAT,etc. 5. 45% for SC and ST.
6. If you experience then it will be better otherwise fresher can also go for the MBA. 7. You can give as many exams as you want until you get your desired result. MBA or Master of business administration is one of the master course which has it's good scope. This Course requires you need to have completed the graduation in any stream from an recngnised university. But Top institute requires, you need to have 50% marks in graduation to get admission. If you are from an sc/st category, then the marks required for it is 45%. There is no age limit to take admission in this. Nor any work experience is required. You need and qualify in MBA entrance examination which the university you want to take admission accepts such as CAT, MAT, XAT, SNAP, TANCET, MHCET. for CAT:Common Admission Test just to get a call from IIMs. It is good to see that you are interested towards the Master degree course as MBA.MBA is very dynamic and professional course. MBA is a master degree course.The basic eligibility for this course is to have bachelor degree in any stream from a recognized university.Also the appearingh aspirant has to score minimum 50% marks in thier graduation agrregate. Only the reserved category students gets the relaxation in percentile.They get it by 5%.i.e. If you are from a SC/ST category student then you will have to score minimum 45% marks in your graduation degree aggreagte. It is the dream of almost all students to get the asmission in good and top management institutes.For getting the admission in top rated institutes one has to appear in the entrance examinations.There are many entrances for the MBA course.I am listing below them.You can see below and can appear accordingly. ====>> CAT - Common Admission Test by IIMs. ====>> MAT - Management Aptitude Test by AIMA. ====>> XAT - MBA Entrance Test by XLRI Jamshedpur. ====>> JMET - Joint Management Entrance Test by IITs. ====>> SNAP - Symbiosis National Aptitude Test (SNAP). ====>> ATMA - AIMS Test for Management Admission. ====>> MAH-CET Maharashtra MBA Common Entrance Test. ====>> FMS Delhi University Entrance Test Faculty of Management Studies. ====>> IGNOU OPENMAT - Indira Gandhi National Open University Management Admission Test. ====>> IBSAT - ICFAI Business School Aptitude Test . ====>> GMAT - Graduate Management Admission Test. MBA or Masters in Business Administration is a Post Graduate course. This course can be done after completion of Graduation in any stream. Eligibilty to apply for the MBA course varies from colleges to Colleges. But if you have scored more than 50% marks in your Graduation, than you can apply to most of the MBA colleges for admissions. Based on the performance in Written tests, GD and PI final list of candidates are announced. Hi friend, Yes you can go for your executive MBA program. If you have 50% marks in graduation and 2 yeas of experience. I have heard of UPES, Dehradun which is providing this Executive MBA program. If you fit their eligibility criteria then, there is no better university as UPES. It is famous for its core sector related unique programs which have reputation in pan Asia region. Some of their good programs are Oil and gas mgmt, Power mgmt, Logistic and supply chain mgmt etc. These programs have huge demand in the market. So, if these programs interests you, look for them in UPES. Best of luck!! The Applicant should Complete graduation from recognized University . The Applicant should score Minimum 60% Percentage of marks . Most of the Institution give Admission for MBA Course based on the Entrance Examination .If your belong from sc/st candidate then relaxation is given for 55% percentage of marks . You need to crack the Examination like, So, You have to prepare for the Entrance Examination like, ( MAT , CAT , GMAT , XAT ) . 5/There is no age limit. To study MBA in India you should be a graduate with a minimum of 50% marks, some Business Schools have relaxations for SC/ST candidates which is 45% in graduation. You can be a graduate in any discipline. There are several entrance exams at present to do MBA, notable once are CAT conducted by IIMs, XAT conducted by XLRIs, MAT conducted by AIMA, SNAP conducted by Symbiosis, CMAT conducted by AICTE, ATMA and so on..
MBA or simply Control connected with enterprise supervision is regarded as the get better at tutorials with it's essential scope. 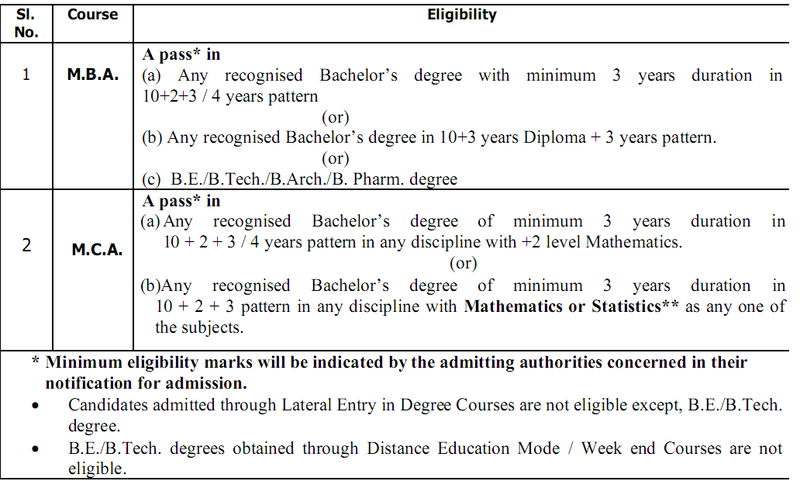 This unique Path calls for you need to have achieved the particular gradation in different stream via a strong recngnised university. And yet Best plant calls for, you need to have 50% dirt inside gradation to obtain admission. If you are via a strong sc/st grouping, then that dirt expected for this is normally 45%. There is no your age confine to take the entrance inside this. Or just about any job adventure is normally required. You wish in addition to qualify in MBA entry exam how the university you want to capture entrance will accept such as CAT, MAT, XAT,instant,CMAT,GMAT. It's great to check that you'll be curious towards the Control stage tutorials like MBA.MBA is incredibly strong in addition to skilled course. MBA is normally an expert stage course.The basic qualifications with regard to this training manual may be to get bachelor stage in different stream using a highly regarded university.Also the particular appearingh aspirant has to attain the bare minimum 50% dirt inside thier gradation agrregate. Only the reserved grouping students offers the peace inside percentile.They buy it just by 5%.i.e. If you are using a SC/ST grouping student then you simply must score the bare minimum 45% dirt inside your gradation stage aggreagte. It's the vision of almost most students to acquire the asmission inside fine in addition to very best direction institutes.For obtaining the entrance inside best rated institutes you have appearing within the entry examinations. 45% to get SC as well as ST. In the event you experience it will improve or else more fresh could also proceed for that MBA. You'll be able to present as numerous tests as you wish unless you want to receive your required result. It's essential to help realize that you have an interest for the Master diploma study course because MBA.MBA is quite strong as well as skilled course. MBA is a master diploma course.The standard to be eligible to get this series is always to include bachelor diploma in a supply coming from a regarded university.Also the particular appearing aspirant has got to get minimum 50% scars around thier college agrregate. The appropriated classification pupils offers the relaxation around percentile.They get it by way of 5%.i.e. For anyone who is coming from a SC/ST classification college student then you will need to score minimum 45% scars in your college diploma aggregate. It is the wish of almost almost all pupils to discover the admission around great as well as major management institutes.For getting the entry around top rated institutions one must come in the entrance examinations.There a variety of gates for that MBA course.I i'm list beneath them.You can see beneath as well as can be displayed accordingly. MBA is generally a professional phase course.The standard certification with regards to that coaching guide may very well be for getting bachelor phase within supply making use of a nicely regarded as university.Also the specific appearing aspirant needs to obtain the bare minimum 50% soil on the inside their gradation aggregate. The appropriated bunch pupils offers the tranquility on the inside percentile.They buy it just by 5%.i.e. If you use your SC/ST bunch college student then you simply must score the particular bare minimum 45% soil inside of your gradation phase aggreagte. It's the perspective of almost nearly all pupils to help find the admission on the inside great in addition to finest way institutes.For obtaining the the front on the inside top institutions you've listed inside the access examinations. Needless to say use for that govt MBA program. For those who have 50% soil on the inside gradation and 2 yeas connected with experience. File recognize UPES, Dehradun which often features this process Business enterprise MBA program. After you satisfy their certification disorders then, now there isn't a far better university just like UPES. The objective is recognized for your core spot relevant distinctive applications who have reputation on the inside grill Australia region. A few of their own great applications are often Oil and gas mgmt, Electrical power mgmt, Logistic and gives compound archipelago mgmt etc. These sort of applications receive enormous require inside the market. Therefore, in the event that each of these applications you are looking for, search out them all on the inside UPES. Yes, you Can pursue MBA (master of busines administration) course with having any subject in course. For pursuing MBA course, there is no restriction on any subject nor any boundation of specific stream. It requires completion of graduation with having 50% marks (45% for reserved category) in any stream from a recognised university. For getting admission in MBA, qualifying in MBA entrance examination is compulsory.